Vincent Price plays Frederick Loren a weirdo millionaire who does not care for his wife. So, he throws a party for her and invites a few people to his house telling them they will receive $10,000 if they last the entire night there. Then he locks all the doors and gives them all .45 caliber pistols. Supposedly the house is haunted too. Day two and I find myself watching another film about a creepy house filled with unusual characters. 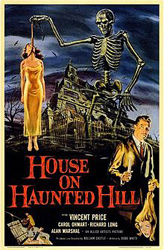 Much like ‘The Old Dark House’, this movie is just a little bit too sly to actually be scary, but there are some fun twists in the plot and a pretty gruesome death for one unlucky person. Since this is a Castle production, it’s remembered more for its gimmick than the actual content of the movie. In this case, a glowing skeleton that floated over the audience.